CleanTech™ Handheld LPC-2000CTH is an water-cooled laser system. 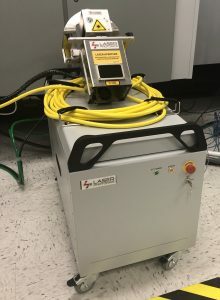 CleanTech™ Handheld LPC-2000CTH is a high performance, industrial-grade, fast, precise and incredibly productive laser cleaning tool. Super Compact it is designed as Heavy Duty Industrial Grade Professional level laser cleaning and surface treatment system for large areas requiring cleaning, de-painting and other surface preparation operations. Microprocessor controlled, system is instantly ready when the key is turned ON. Touch screen allows you to choose among the 5 pre designed cleaning patterns. Heavy duty industrial design is based on years of experience building Hand Held Lasers for marking and engraving applications. No PC needed. Can be coupled with industrial robots and placed inside safety work cells with interlocks for full compliance with OSHA and FDA CDRH as Class 1 Laser Systems. Can be installed inside the Class 1 Industrial Cleaning Platforms like Titan and Titan Express for hi throughput parts cleaning. Mold release cleaning, shipbuilding industry and Marine Corrosion removal, Decontamination, Zink coating removal for welding operation, automotive parts manufacturing, food processing equipment cleaning, sewage treatment, rubber tires, gas and oil industries, rust removal, aero craft de-painting, coating and paint stripping, degreasing, parts pre-coating, pre-welding treatment ope5rations, welding treatment, oxide removal.